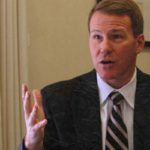 Jon Husted is Ohio’s Republican secretary of state and one of the nation’s preeminent vote suppressors. Husted has purged over 2 million Ohioans from the rolls since taking office in 2011, roughly 800,000 of whom were removed for simply not voting. The U.S. Supreme Court dealt a huge blow to fair elections nationwide by upholding his voter purge scheme in Husted v. A Philip Randolph Institute. Not long after that, Husted’s office issued a directive giving county election administrators the green light to restart the voter purges. These purges have proven to disproportionately disenfranchise low-income Americans, people of color and Democrats in Ohio, and are viewed as a political benefit for Republicans nationwide. And that’s not all. Upon taking office in 2011, Husted established specific times for voting across the state, chipping away at locally-established voting polling periods and effectively disenfranchising urban voters facing long lines at polling places. Husted is now running for Ohio lieutenant governor alongside GOP gubernatorial candidate Mike DeWine.